Caner is a FAKER. (not fakir!). He has been demonstrated to have lied in public, before crowds, in a wide variety of circumstances. It is his act, not the truth. He is putting on a one-man show, which could be entertaining if it were not so abusive of his audiences. Ha Ha Ha. That's George Costanza from Seinfeld. 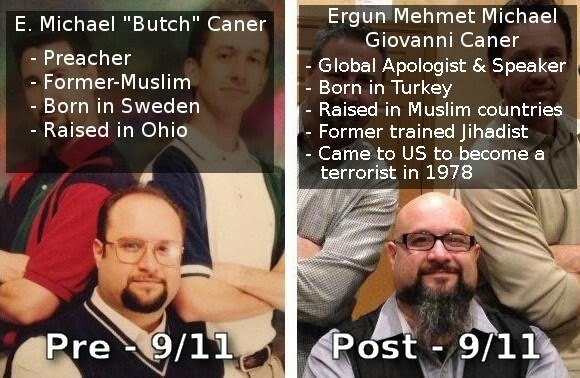 That Caner tries to appear as a menacing jihadist. He is a wimpy Constanza. Bald, insecure, loser. Looks like since 9/11 he's gotten fatter and grown his beard out to match his Islamic Jihadi backstory. Has anyone considered he might be a present-day "Psalmanazar the Formosan Cannibal", i.e. an impostor and fabricator for fame?